This truck, the 2019 RAM 1500, is heavily revised and fortified in the 2019 year! This is a reliable pickup already, now it is as if RAM just added a ton of strength right into its bones all at once, plus installed user-friendly tech and passenger-welcome comfort simultaneously. The 2019 Ram 1500 truck extricates 225-lbs from its overall weight and yet brings strong front brakes that have an 18 percent increase in brake pad surface. Another change is seen in the logo and "RAM" grilles as well as gaining an eTorque boost (mild-hybrid) motor election, among many others. New frame lengths appear, there's a new Max Tow Package, and the cabins get a ton of refinements, including dual Rambins for storage. 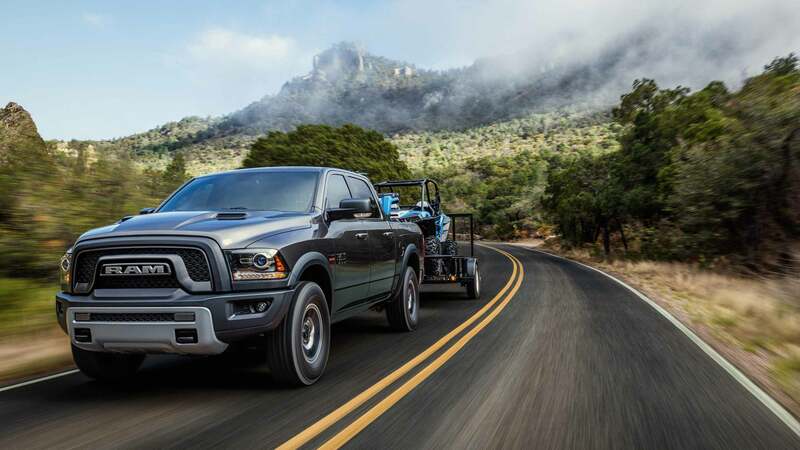 The 2019 Ram 1500 is the lone full-size truck with not only automatic load-leveling, but also with a 4-corner air suspension system-- both welcome features on any pickup. Let's dive deeper down into this standout vehicle's features and capabilities. What type of engine and transmissions could be in the 2019 Ram 1500? A new 2019 RAM 1500 gets things going with a 269 lb-ft of torque creating Pentastar 3.6L V6 that also manufactures 305 horsepower. This V6 makes use of a new eTorque mild-hybrid configuration with a 48-volt motor that charges and also assists the fuel-saving start/stop function. The economical battery pack fits on the rear wall of the cabin. 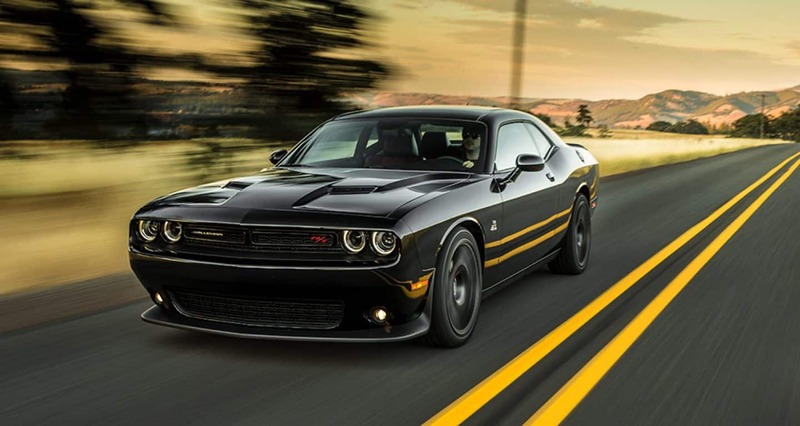 Moving over to the 5.7L Hemi V-8, this engine manifests 395 horsepower and 410 lb-ft of torque with a regular transmission-- but with the eTorque transmission instead, that same engine acquires 130 lb-ft more torque. The HEMI V-8 in the 2019 Ram 1500 borrows the talents of an electric 850-watt cooling fan with Pulse Width Modulation to keep it running cool and therefore stronger for longer periods of time. The standard transmission inside is fully electronic TorqueFlite 8-speed automatic for whichever engine, and the 2019 RAM will tow 12,700 pounds or haul nearly 2,300-lbs when it is properly equipped. Ram also installed a new electronic locking rear differential as the standard for 2019 within the Rebel model, but it is possible to add to any model via the 4x4 Off-road Package. Can you explain the Rebel model specifically? The Ram 1500 Rebel is now purchasable in the Quad Cab setup and has new 18" wheels (20" available) using an electronic-locking rear differential with standard 33" Goodyear Wrangler DuraTrac tires. The Rebel previously came standard with Ram's Active-level 4-corner air suspension and a 1-inch suspension lift. That air suspension remains gettable, however, the 2019 Rebel is standard with a coil spring suspension and a 1-inch factory lift. The Rebel is noticeable with the overall off-road design and also specifically by the rear-fender decals. Revised Bilstein shocks utilize remote reservoirs to ensure the shocks maintain a cool temperature and coordinate with the special rear suspension to demand traction from the tires, plus, the Rebel is standard with Hill-descent Control. Burly tow hooks with wide bumper housings make them easy to use, coupled with bottom skid plates on the steering system, oil pan, transfer case, and gas tank. Rear-fender decals denote trucks equipped with the 4x4 Off-road Package. 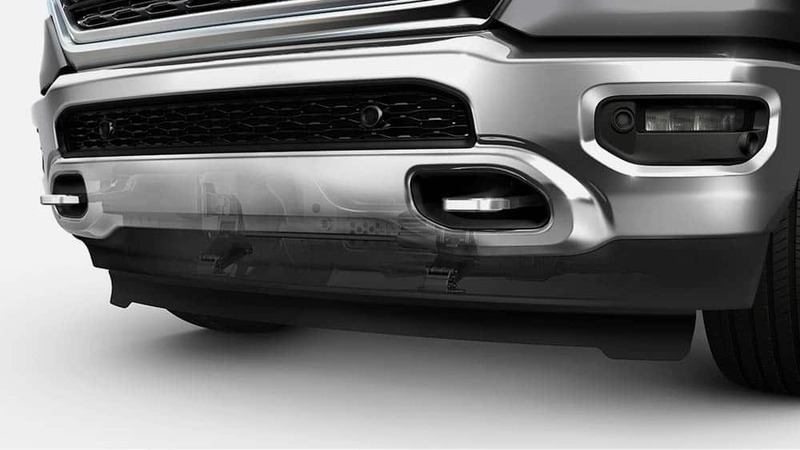 What are some of the many design elements of the 2019 Ram 1500? 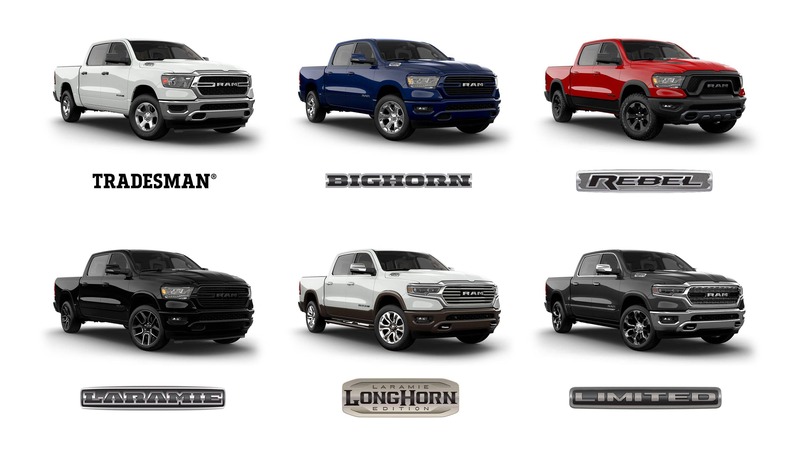 Models-wise, Ram has you covered with the Rebel, Laramie, Tradesman, Bighorn, Laramie Longhorn and Limited. 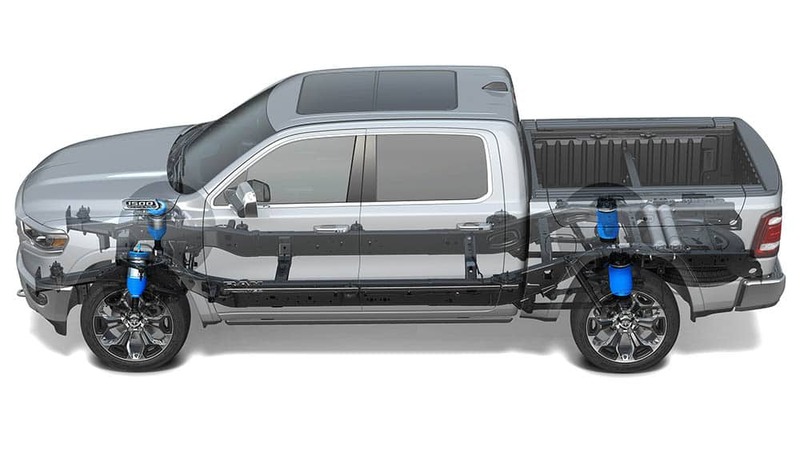 Notice as well that there are new overall lengths: a 144.5-inch wheelbase on Crew Cab short beds, a 153.5-inch wheelbase on Crew Cab long beds, and Quad Cab versions see a long bed with a wheelbase of 140.5 inches. 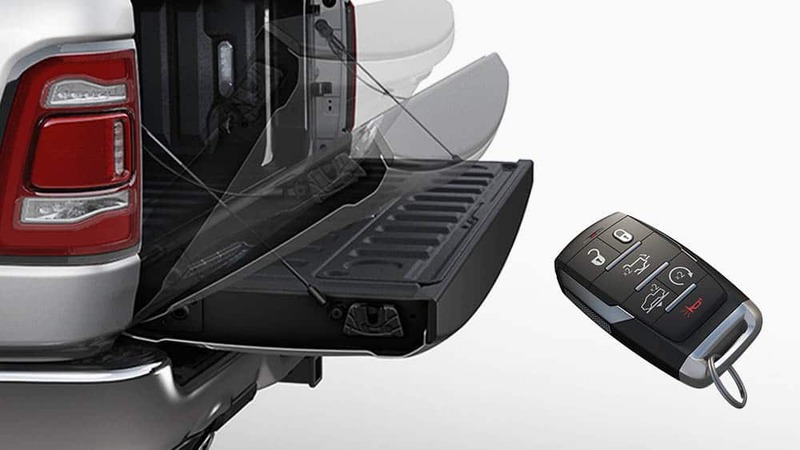 You can lock or release the power tailgate with a press of a button on the keyfob, there's a true flat-load floor with dual integrated Rambins, an open flat shelf above the glove box, a new toggle switch bank, and a freshened-up center console with 12 storage possibilities (including one for a laptop). There's also a 900-watt sound system and/or a 43.4" panoramic sunroof that you can have installed, plus the 1500 comes standard with 5 USB ports. An obtainable audio choice could be a Harman Kardon system with a 10" subwoofer and 19 speakers, which is exemplary in a truck interior. A 12-inch touchscreen display (alternate is 8.4 inches) has a view that allows split applications to run side by side. Assisting with fuel efficiency is the active grille shutter, while lighting the way was never easier with choices for, full LED, Halogen, and full LED with Adaptive Front-lighting System (AFS). That AFS option lets the Ram help you see around turns better and things of that nature by moving with the wheel direction, for instance. The 2019 Ram 1500 represents boldly via twelve outer paint selections, including some new ones: Patriot Blue, Billet Silver, Diamond Black Crystal, and Tri-coat White. Also assisting the driver inside is the all-new SiriusXM with 360L, 4th-gen Uconnect, the popular Apple CarPlay and Android Auto capability, and an option for a tan navigation system with futuristic 3D map renditioning. There are over 100 standard and obtainable safety/security points of interest in the all-new Ram 1500 for 2019. Some of those include the Surround View Camera, Adaptive Cruise Control (ACC) with Stop/Go/Hold, ParkSense Parallel/Perpendicular Park Assist, an Electric parking brake, 9-1-1 Call/Assist Call, LaneSense Lane Departure Warning-Plus, an Adaptive Front-lighting System, and Tailgate ajar notification. Tire blockers also make the list, as well as an energy-absorbing front frame rail structure, an advanced multi-stage front driver airbag, and Rear Cross Path (RCP) detection. So rest assured, this category is as filled out as the rest! Come see us over here at your next best opportunity, and we'll get cracking on discussing the 2019 RAM 1500 in person!